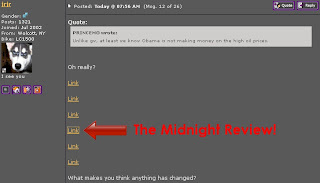 The Midnight Review: Message Board References Midnight Review Post Without Reading Contents! Message Board References Midnight Review Post Without Reading Contents! I thought this was funny and that I had to share. I had noticed that I had received some site traffic today from a message board by the name of Intruder Alert Cafe. From what I gather it is a motorcycle website. Anyway, there was a message thread about President Obama, which began complaining about the high price of gasoline and how Obama wants gas to stay high. "I believe Obama is OK with $5 gas, it will curb use and that is right down his alley," commenter Plowboy wrote. "He needs to get it up now so it is not such an issue in the 2012 election, old news high priced gas is." Down the thread, another user by the name of "jrjr" left a list of links supposedly proving Obama is making money off of gas, using my website as a source. This is the funny part - the article they linked to regarded the propaganda regarding campaign contributions to Obama's presidential campaign three years ago. These misinformed individuals didn't even read what the article is about!